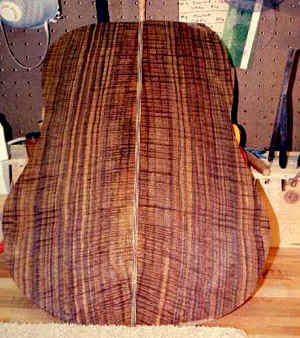 This page of the web site will follow some aspects of the building of the walnut guitar. The more generic portions of the process will be shown in my new section on building guitars which will be a comprehensive journey through the guitar building process. Not much to show yet. Just the walnut I will be using for these guitars. 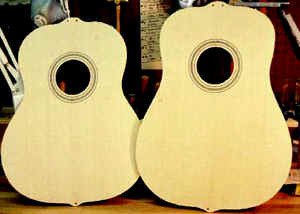 (One will be a Dreadnought shape for my customer, one a concert shape for my own curiosity.) I have joined the backs and the tops. Next they get rosettes and back stripes, and then sanded to thickness. More photos to follow. 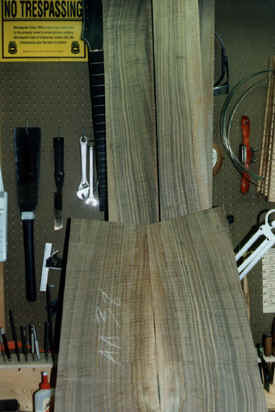 This photo shows the same wood after the center strip is inlayed, it has been sanded to thickness and rough profiled. I also wiped the wood with a wet paper towel to accentuate the grain -- this approximates the look it will have when it is finished. These are the tops I will use for the walnut guitars (I am making one of each shape -- concert and D). The rosettes are inlayed, the top thickness sanded (many thanks to Jim Olson for use of his sander) and the shape profiled. If you look carefully, you will see two small holes near the top and one at the bottom. These are used to locate the top in some of the subsequent jigs I use. More about this as time goes on. Construction of the guitar continues. Shown here is the side after being trimmed to shape on the spindle shaper. I find that it is easiest to trim the side to the correct profile before I bend it -- other makers (such as Jim Olson) do this later in the construction project. It is essential to wet the wood before bending it. Some builders merely moisten the wood, but I have always soaked it in hot water. I use this trough (which I had made out of stainless steel after my first one rusted out), and put it on a hot plate. I soak it for about 10 minutes, which is the time that it takes for my bending jig to heat up to operating temperature. Although this photo is none too clear, it shows one of the ribs being bent. 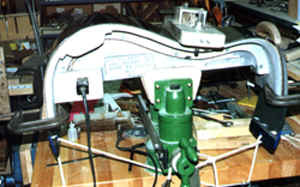 I have included another photo of the bending jig on another page. After the wood is soaked, and the jig is heated, the wood is clamped tightly to the jig, and heated for about 10 minutes, after which it cools to room temperature. While the photo doesn't clearly show it, there is a thin sheet of stainless steel on top of the wood, which is pulled as tight as possible. This will help keep the rib flat, and is helpful since the wood normally has a tendency to curl from side to side. Here is the first of the ribs, bent.